« Christmas music of another sort #2. Going up? Owner of #58-60 Main Avenue wants to add a third floor. A neighbor is concerned. #58-60 Main Avenue. Blogfinger photo. © 2016. 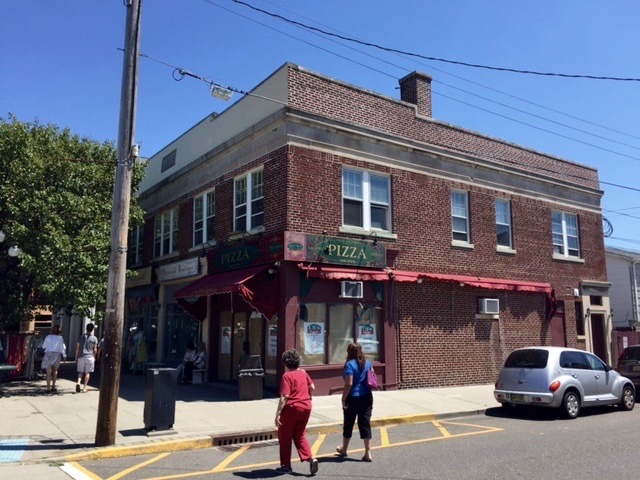 In June we posted an article about plans to add a third floor to the Pizza building at #58-60 Main Avenue. The link is below. “Are we witnessing the intentional progressive increase of density on Main Avenue that will make our downtown more congested with more parking troubles? Are we witnessing an acceleration of illegal approvals by Township officials beginning lately with Mary’s Place, then the rebuilding of #50 Main Ave, and now #60 Main Avenue? “I received this letter on Friday about them adding a 3rd floor to 58-60 Main. This means more construction, more parking congestion as well as destroying the views some of the neighbors currently have. Editor’s note: This building is non-conforming. We think it may be illegal to allow that third story because that addition will also be nonconforming. It will create greater density, greater parking problems, and more traffic congestion–all of which will make conditions worse, not better, on Main Avenue in that commercial area. Zoning approvals are supposed to make things better with the exception of special circumstances, which this plan is not. 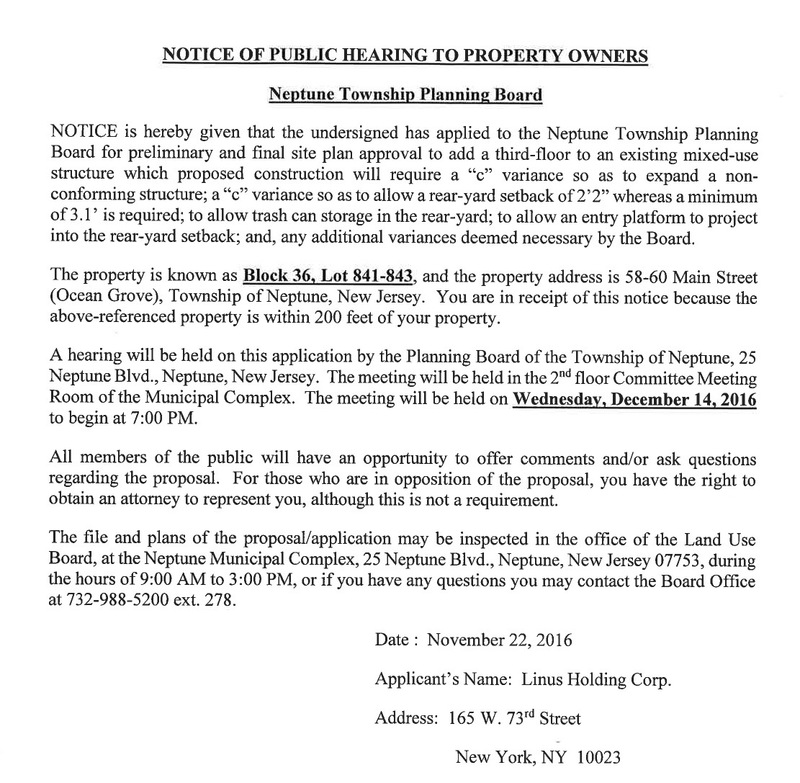 If you oppose these variances, you would have to go to the hearing and bring a land-use lawyer with you. But you may be talking yourself into a law suit. It’s a job for the Home Groaners Association, but they will never step to the plate for the town in matters such as this. The Planning Board will do what it always does by giving permission to allow more residential units in a neighborhood without requiring off-street parking. It’s the way things are done in Ocean Grove. Take a look at Asbury Park where nothing gets built without providing off-street parking. It will get approved, just like everything else in town has been illegally been approved. The owner has an undefeated record with winning these type of approvals in other towns and in other states. He’s not sweating or losing sleep over it. The building’s shop owners must be worried about how this will affect them & their business. To think that simple small silly things are not approved for business owners in town or for residents, but these big developers come into town & empty their pockets and things that are against the rules – always gets approved. It’s not surprising anymore, but it will always be disappointing. Isn’t it interesting that they ask for a third floor, but there is no mention as to what they would do with that third floor. Probably they would leave the 2nd floor rental apartments and then place luxury condominiums on the third floor. Let’s check the site plan. b. PB16/11 – Linus Holding Corp. – Block 209, Lot 1 – 58-60 Main Avenue – Applicant has submitted an application for Preliminary and Final Major Site Plan approval to add a third-floor to an existing mixed-use structure along with associated improvements. Applicant is represented by Andrew J. Karas, Esq. Didn’t know if you had seen this.